Gentleman Auction House's Virtual Tag-A-Long: MATES OF STATE! HEADLIGHTS! BLUEBIRD! TONIGHT! 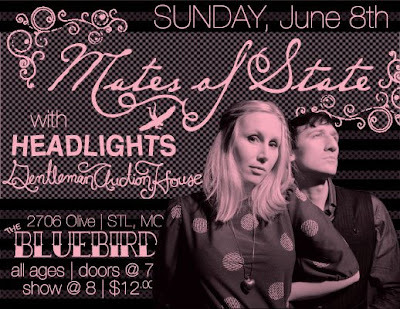 MATES OF STATE! HEADLIGHTS! BLUEBIRD! TONIGHT! We can't contain our excitement for this show! Get there early! We go on at 8:00! Don't blog about it, BE about it! Blogger!? I just met her!